Today was the last day of spring school and Friday is cooking day. Today we made kinako dango and ate them on the balcony. They were very yummy! See you next school year! Today we made frisbees out of paper plates. We painted two papaer plates then glued them together. That’s it.They’re easy to make and playing with them is fun. You shoud try it! 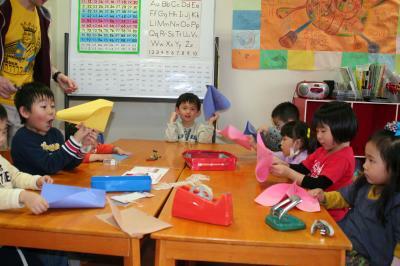 Today we got ready for spring the American way – by making kites! We usually play with kites in the winter (New Years), but in America they play with them in the spring. 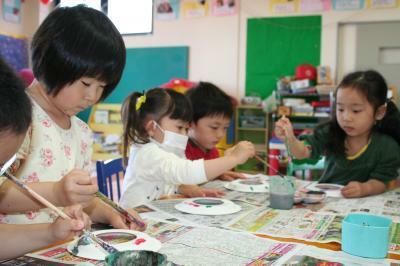 This week we have spring school. The theme is ” Spring & Review “. 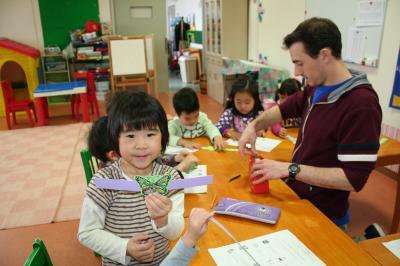 Today at art time we made cute butterflies. 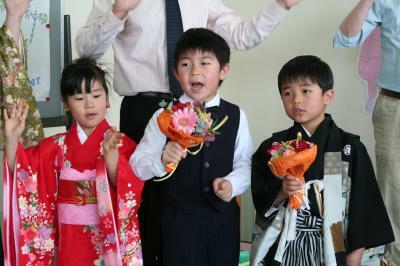 Today was the last day of the our school year, and after circle time we held a completion ceremony. We also gave our classroom a good cleaning with a feeling of thankfullness, and received our report cards. 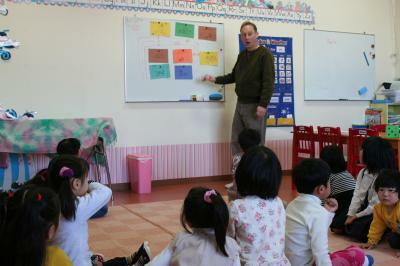 Our teacher hung pinctures of many kinds of jobs in the classroom and then we played a game. After our teacher asked us ” Where is the ____?”, we looked for the person and then spelled out the words. Last Sunday we held our 2013 – 2014 graduation ceremony. This is always both a very happy and a very sad day for everyone. We all celebrated by dancing, singing songs, and discussing memories of our friends who graduated. 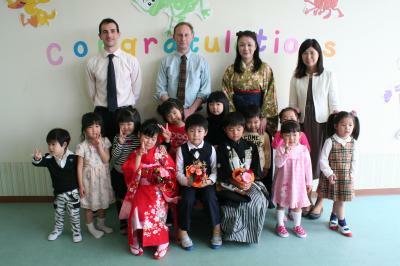 Students, parents and teachers were all impressed by how much they had grown both physically and mentally. Thank you everyone for all the happy memories! Show & Tell: What do you want to be when you grow up? Friday is Show & Tell day. Today’s topic was, “What do you want to be when you grow up?” We drew pictures of our dreams and discussed them. 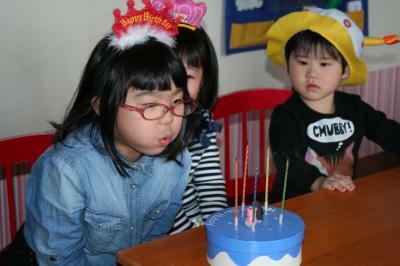 Today we had a birthday party for our friends born in March. We sang songs, looked at their baby pictures, asked them questions and cooked delicious marshmallow bars together! It was a very yummy snack. You shoud try them! Today we picked our favorite songs from this year. 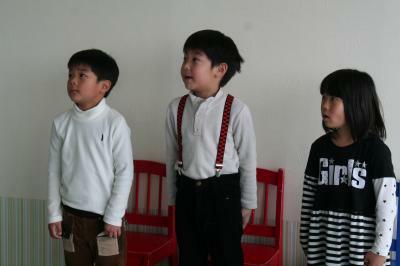 We’ll sing them at our graduation ceremony on Sunday, March 16th. Show & Tell: What’s Near Your House? Friday is Show & Tell day. Today’s topic was ” What’s near your house?” We drew a picture of things found around our houses and discussed them. 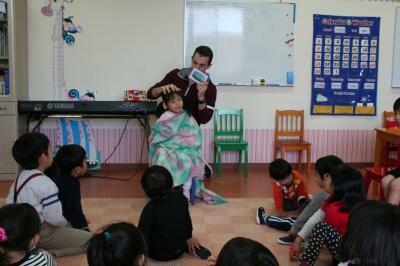 Today we made a pretend vist to the hairdresser. We leaned words associated with grooming like scissors, shampoo, and mirror. We had fun at the hairdresser. You should try it. Today we did some counting practice using animal and number cards. We put them together to make a long train. Tomorrow we’ll count higher and make an even longer train! 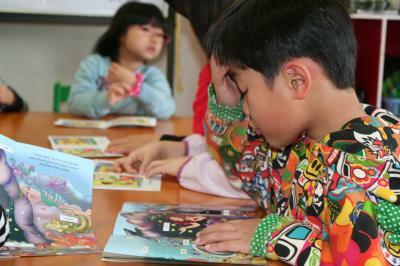 Today is shared reading day. This month’s reading story is “Little Mermaid.” We learn a lot of new words when shared reading, and It’s fun!